In many ways, the point of my 500 Days Of Film Challenge is to catch up on the films that I have missed over the past five or so years. However, it is hard to believe that anyone missed Harry Potter And The Deathly Hallows Part 1 (or HP7A as Mark Kermode and Simon Mayo call it on their fabulous weekly film show). In this, the penultimate film in the much loved series, Harry, Ron and Hermione continue on their quest to find all of Voldemort’s Horcruxes. Along the way, they find out about the existence of the three most powerful objects in the wizarding world - the Deathly Hallows. Join The 500 Days Of Film Club And Never Miss A Film Again! I first watched this film when it came out in the cinema. I remember finding it oppressively dark (in a light and dark not a dark and twisty way), thinking that the camping scenes went on forever and feeling that the film was all set up with no real pay off. It wasn’t that I didn’t enjoy the film, it was more that I felt it to be a rather long intro to the final act. Of course, we all then had to wait an entire year for that final act. This time around, I decided to watch the two films (7A and 7B) over two nights. Strangely, the darkness that I had felt off-putting the first time, didn’t bother me at all. In addition, the camping scenes didn’t feel an eternity either. In fact, I felt myself appreciating and savouring the film the second time. It was actually quite emotional to think that the series was drawing to a close. Perhaps I was just too impatient to get to the best bits of the final novel during the first screening. The film launches straight into the action and the loss of a key character alerts you to the fact that not everyone will survive. The tension is high from then on. 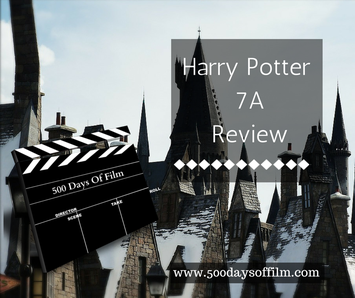 The plot rattles on at pace (including some superb special effects) and Harry, Ron and Hermione’s friendship is greatly tested. I felt engaged throughout. However, director David Yates is never afraid to slow things down when necessary. The scenes at Godricks Hollow, for example, are genuinely emotional - before they get pretty creepy! I didn’t much feel like watching this film again but I am so glad that I did. I want Hermione’s enchanted bag! If I could have one of those magic tents I might consider camping… maybe.